-I don’t know who said this, but think it’s funny. My whole life people have asked if I was born on Valentine’s Day. Though some of my ancestors were from Russia, my parents just liked the name Valentina. They thought it was pretty, happy and lyrical. I agree and I’ve always loved it. I thought Valentine’s Day was so fun when I was little – exchanging little heart-shaped cards with friends and eating sweetheart treats and various heart-shaped chocolates. And as an adult, it never mattered if I was single or not on this day of love. I still always looked forward to it! I don’t know why, really — it’s sort of silly to have a designated day to celebrate love, right? We should celebrate love every day! Duh. After all, my favorite time to get a surprise bundle of beautiful flowers from my husband is on an ordinary day, not a holiday. And similarly, of course I would eat Valentine’s Day Nutella Brownies absolutely any day. Any time or place, for that matter. And really, that goes for most Nutella recipes. Hearts should always be full of love. And possibly also full of chocolate. Or in this case Nutella! So, spread a little love around on Valentine’s Day — and everyday — with these super cute, super delicious Valentine’s Day Nutella Brownies full of Heart! Make them this weekend! And would you believe this recipe only has three ingredients? It’s true! And yes, of course you can skip the little hearts. I know everyone doesn’t have that little cutter on hand. These brownies are delicious either way. up to 1 day and at least 4 hours ahead: Make the batter and bake the brownies. up to 1 hour and at least 20 minutes ahead: Cut out the hearts and fill them up! You can actually make the brownie portion, through the baking a few days ahead, and freeze them, wrapped tightly in plastic. When I do this, I like to warm them in the oven just before serving. Don’t add the Nutella to the heart until after you defrost them. Valentine's Day Nutella Brownies are over-the-top rich, creamy and dreamy! There's chocolate, hazelnut and a little love in every mouth-watering morsel! *WARNING: This is a bizarre batter -- it won't look or have the texture of a regular brownie batter. DON'T WORRY! It should be like this. Separate the eggs placing the whites in a medium-sized mixing bowl, and the yolks in another. Add the 1 1/2 cups of Nutella and cocoa powder to the egg yolks and mix until it's evenly blended. Set aside. Fold the whipped whites into the Nutella mixture until they are fully incorporated. This will seem difficult at first because the Nutella batter is quite thick. Keep mixing and it will incorporate. You can also use the electric mixer here to make it smooth, but for as little time as possible. Bake in the preheated oven until they have risen, are solid and have a crackled surface, about 10 minutes. They will fall down a bit in the center after they are out of the oven. Let them cool in the pan for at least 15 minutes. If you haven't used cupcake papers, use a small knife to go along the edges of each brownie to loosen it. Then they should pop out easily. Let them cool to room temperature. Add the remaining 3 tablespoons of Nutella to a small zip-lock bag and cut a tiny bit off of one of its bottom corners. Then, holding the tip close to the bottom of each hollowed out heart, squeeze gently to fill it up. Serve with the tiny heart cut-outs. I like to keep it simple and Nutella-y, but of course these would be adorable if you filled the hearts with pink or red frosting. You can also make these brownies in an 8 x 8 x 2-inch baking dish. The baking time will be longer, maybe 20 minutes or so. Let them cool for at least 30 minutes before cutting them into squares and serving. OK, this looks amazing – and only three ingredients ?!!? – I am bowled over. Must try these at home. I made these babies last night and used a mini muffin pan. SO CUTE! And yummy! They were a hit at work. Thanks for sharing! Trying to convince my husband to make these for me right . . . now. YUM. Waw! What amazingly, tasty & apart only 3 ingredients muffins!! These are so amazing! I cannot wait to try the recipe out with the little one. They are going to make a wonderful Valentine Gift! Thanks for sharing! these look FAB 😀 it says 250 degrees for the oven is that Celsius or Farenheit ?? i really wanna make them !!! Hi Fenella — it’s 350 F. I just made the edit 😉 — Enjoy these and Happy Valentine’s Day! Love the story about your name! And of course the Nutella brownies are awesome! Happy Valentines Day! We don’t need Valentine if we have these Nutella brownies! :)) They are so good! I’m with you, Hannah! Thanks! These look so easy and delicious!!! I wish I had one right now! They really are easy. And delicious. 😉 Hope you try them, and thank you! These look so cute and perfect for Valentine’s Day! I love Nutella desserts! That is such a cute idea to cut out the little hearts. These sound perfectly rich! These look absolutely incredible! 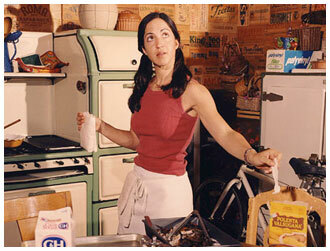 Happy Valentine’s Day to you, Valentina, and thanks for all your wonderful recipes throughout the year! I love them all – and, if nothing else, Valentine’s Day is about love.